PLEASE CLICK 'SEE YOUR PROOF' BUTTON BELOW TO VIEW YOUR FORM WITH YOUR IMPRINTED INFORMATION. SPECIAL IMPRINT AND LOGO WILL NOT SHOW. Register forms are ideal for any business. In a register machine, they are available on your counter or in your vehicle. All parts stay aligned and the hard surface saves you from hunting for a spot to write your order. 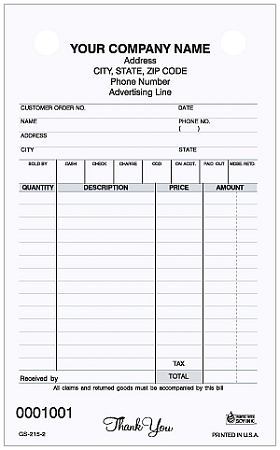 This form is also available in a 3-Part version GS-215-3.